Description: Teachers and trainers across the country recommend Janet Caughlin's best-selling book AppleWorkshop for Teachers as the #1 AppleWorks tutorial on the market--bar none. Janet has poured her nationally respected expertise on the popular and important AppleWorks (formerly ClarisWorks) all-in-one program, as well as her 29 years of classroom experience as a teacher and trainer into this resource, which is now in its 6th edition. It's your quickest introduction and best reference tool for AppleWorks. The step-by-step lessons in this book contain tons of screen shots and visuals. You follow right along on the computer, using templates you open from the accompanying CD-ROM. This book has been carefully designed to help both first timers as well as advanced users make better use of their valuable teaching time. You can learn as much as you want at your own pace. Trainers can print out individual lessons to teach specific concepts, or they can use the book as the basis of a complete stand alone class or training unit. 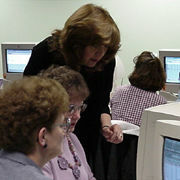 AppleWorkshop for Teachers (formerly ClarisWorkshop for Teachers) is the only AppleWorks tutorial with simultaneous and complete coverage of 5.0, 4.0, 3.0 and 2.1 versions of both the Macintosh and Windows versions of AppleWorks. A special new book, AppleWorkshop for Teachers 6.0 focuses exclusively on the recently released AppleWorks 6.0, including its new Presentation module. All editions of AppleWorkshop for Teachers cover the word processing, drawing, painting, spreadsheet and database modules, plus advanced AppleWorks features. The 6.0 version also covers AppleWorks' powerful new Presentation module. Both the book and the CD-ROM are jam packed with practical classroom ideas and resources including original clip curricular clip art. -Macintosh: 4MB RAM, System 7 or higher, ClarisWorks 2.1, 3.0, 4.0 program, or the AppleWorks (formerly ClarisWorks) 5.0 program. -Windows: 4MB RAM, Windows 3.1, Windows 95/98, ClarisWorks 2.1, 3.0, 4.0 program, or AppleWorks (formerly ClarisWorks) 5.0 program. I can throw out the manual that came with the program!" This book is great. It's like having your own tutor right there. The comprehensive index makes the book an excellent reference. It is easy to find just the right information to solve a problem, and not have to wade through an entire chapter of material. We have successfully used the Caughlin book to inservice hundreds of teachers." Alice Strachan Barr, U.S. Embassy (AIS/D), Washington, D.C.
Toni Shadiack, No. 25, Paterson, N.J.